Flashback to October 2000, Amilcar “Mica” Cipilli was the first person waiting in the parking lot of Durango High School with 6 students ready to help setup the event. I’d never met him before that day other than brief phone conversations, but looking back, Mica was head instructor of one of two schools back then and he knew how important donating his time and energy and love for the sport to help Grapplers Quest possible. “I’ll never forget how honorable Mica was to help us at the first Quest in Las Vegas, 12 years ago. It was one of the truest forms of martial arts code of the warrior. Help build your neighbors village and when the enemy comes, you will already have assembled an army through UNITY,” commented Grapplers Quest founder, Brian Cimins. From a 16 competitor team in 2000, to a 106 person team per event in 2010-2011, Gracie Humaita dethroned the previous and tremendous champions, Carlson Gracie Jiu Jitsu Team. Congratulations again to all competitors, coaches and fans who helped make Grapplers Quest’s 20th trip to Las Vegas, the best event ever. Gracie Humaita Las Vegas team is led by Amilcar “Mica” Cipilli. This is Mica’s 3rd Overall Title in Las Vegas in five years. Amilcar “Mica” Cipili is a 3rd degree black belt with more than 90 titles in major competition (see titles below). “Mica” was born in Rio Grande de Sul, in the southern region of Brazil. While growing up, Mica developed an interest and trained in martial arts such as Capoeira, Boxing, Kung Fu, and Judo. Later in life, after watching a Vale Tudo competition in Sao Paulo (Jiu Jitsu vs. Luta Livre), he made a decision to learn the great sport of Jiu Jitsu. Mica understood the reality of fighting, and what really worked. Amilcar began training in Brazil and then Utah under Pedro Sauer, where he progressed to the level of purple belt. In California, Mica trained with the Machado brothers, Rigan and Roger. Mica then earned his black belt from Rigan Machado. Amilcar has trained with great names in the sport of Jiu Jitsu. Professor Cipili has been recognized for the outstanding level of his techniques. 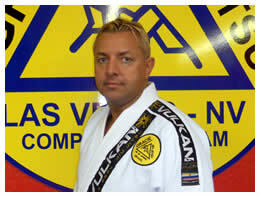 He relocated to Las Vegas, NV in 2001 and today is the head instructor of The Gracie Jiu Jitsu Las Vegas. Under the influence of great masters of Jiu jitsu, Mica learned and achieved a higher level of technique and teaching ability. As a competitor, Mica competed in most tournaments that took place in Brazil and the United States, resulting in titles in nearly all competitions. His competition career began in 1995 and continues today. Mica also trains Judo and Wrestling to continue to strive to become a complete fighter. Mica has taught classes in Utah for the Brazilian Jiu Jitsu Pedro Sauer team and while in Brazil, he taught in Sao Paulo. After moving to California he taught at the Machado Academy in Pasadena where he was one of the key instructors. He is now an official instructor of The Gracie Jiu Jitsu Las Vegas. His love of the “gentle art” of Jiu Jitsu has given him the ability to transfer skills taught to him over to his students in an efficient, simple, and professional manner. Boston Grapplers Quest on September 17 Expected to Northeast’s Largest in Grappling History!